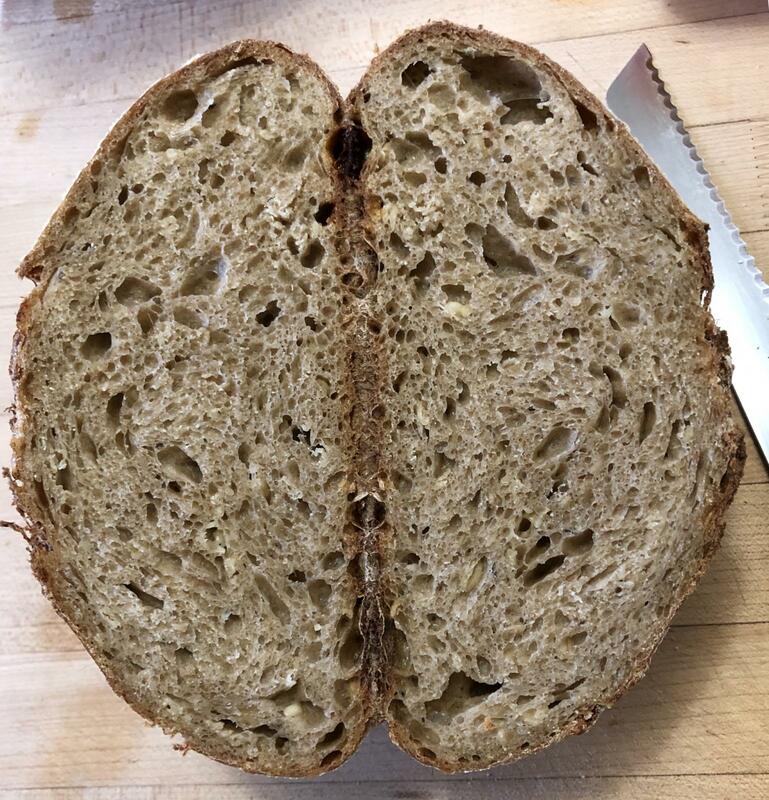 I was checking out my bookmarks to see what to make next and Antony Power’s Irish Stout, oats and cheddar cheese sourdough really appealed to me. I scaled it for 3 loaves, used a bit more whole grain, added a bit of yogurt and changed the method to follow my usual procedure. I hope it turns out as well as his. Mill the Selkirk and Rye berries and sift to separate the high extraction flour from the bran. Place 200 g of sifted Selkirk wheat flour and 100 g of sifted rye flour in a tub and add the unbleached flour to it. Cover and set aside. Save the bran and the left over high extraction flours for feeding the levain. Take 18 g of refrigerated starter and feed it 18 g of filtered water and 18 g of the reserved bran. Let rise in a warm place. Cut the cheese into very small cubes, sprinkle with a bit of flour, toss and place covered into the fridge. 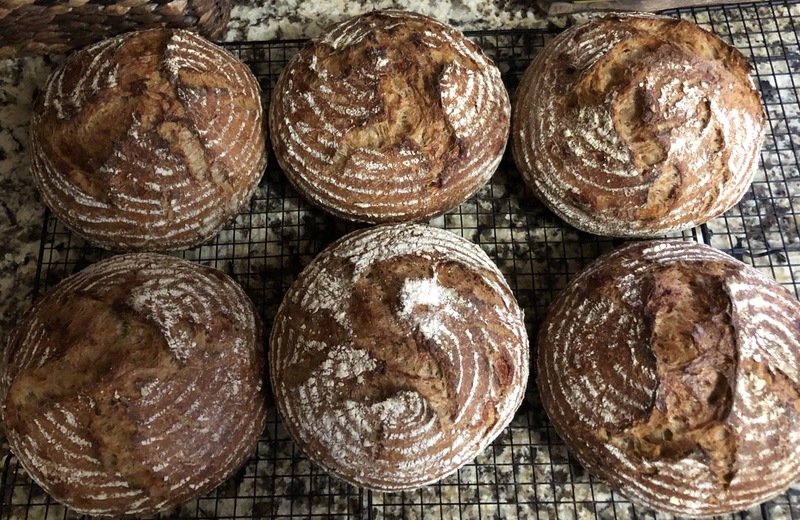 In the morning, feed the levain 72 g of filtered water and 72 g of high extraction/AP flour and let rise 4-5 hours in a warm spot. The plan was to mix the soaker together and cover. Then two hours or so before the levain is ready, to put the soaker in a stand mixer’s bowl and add the water. And using a dough hook, to mix to loosen the mass and add the flours from the tub. Well, I forgot to soak the oats in the stout and I went out. I didn’t realize this until I got home. So the stout, the water, the oats and the flours all went in together for the autolyse. Once the levain is ready, add the salt, the yogurt, and the levain to the bowl. Mix on the lowest speed for a minute to integrate everything, then mix on the next speed up for 5 minutes. About half way through the 5 minutes, add the cheese cubes. Remove dough from bowl and place in a covered tub. Let rest 30 minutes in a warm spot (oven with the door cracked open and the lights on). Do 4 sets of stretches and folds at 30 minute intervals, then do two more sets on hourly intervals. After the last fold, place the dough in the fridge for a couple of hours. The dough rose about 40%. Tip the dough out on a bare counter, sprinkle the top with flour and divide into portions of 850 g. Round out the portions into rounds with a dough scraper and let rest 60 minutes on the counter. Beer, bread and cheese all in one.. with oats for heart health! Wow.. I ask you.. can life get any better? Can't wait to hear how it tastes. I know it will be tasty....how couldn't it not? I don't think you have to worry too much about skipping the soaking. I've used dry oats many times as it worked fine. would take care of the soaking especially when I leave it for a couple of hours. I used to make a honey oat bread in the bread machine and I didn’t soak the oats for that either. It’s good to know that I don’t need to make a soaked or porridge each time I use flakes of some kind. a couple of weeks ago. 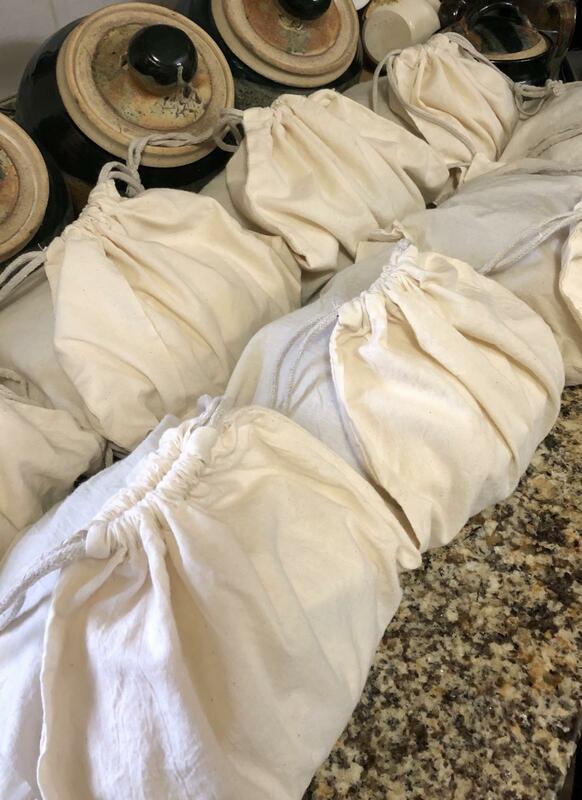 I bought muslin bags for my customers to take and keep their loaf. Once home, I tell them to put the loaf bag and all into an air tight container such as a lidded pot or a cookie tin. When they pick up their next loaf, they bring the bag back and I wash it. The bread keeps nicely and the planet has a few less plastic bags to deal with. is much more subtle than I expected. Everything blends together nicely. I like the idea of a savory oatmeal loaf. No reason to let sweet add-ins steal the show!